When the name Dr GL pops out, naturally you will think it will be expensive since she is a known celebrity aesthetic doctor. I tried this product when it was first launched last year and never looked back. The product was packed with lots of goodness and it was very reasonably priced. 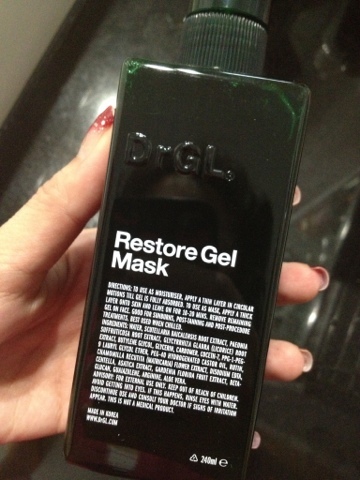 It is a dual used product; can be used as a mask or just as a daily moisturizer. As a mask, just slap on a thick layer over the face and wipe off the excess after 30 mins. As a gel moisturizer, just smooth onto face as required. It is best used after laser, peels etc. A proprietary blend of natural ingredients including Gardenia Florida Extract and Scutellaria Root Extract heals skin with its antioxidant, anti-inflammatory and antibacterial powers. Its blue hue extracted from Guaiazulene helps counteract redness while its all-natural fragrance exerts calming effect. Do check it out soon!